Do you know how dirty your kitchen sink is?. WARNING: This might gross you out a little bit. Even your toothbrush isn't safe. CNN reports that a new study suggests that there may be lot more germs growing on your dish cloths than expected. And the bigger your family (or number of housemates) and consumption of meat, the more germs there are. Researchers took bacteria from 100 different dish towels after a month of use to figure out both the type and amount of bacteria that had grown on them. 49% of the towels showed growth of bacteria normally found in the human body. Of those 49 towels, almost three quarters grew bacteria normally found in the intestines such as E. coli and Enterococcus species. Another 14% grew what is commonly referred to as “staph”, Staphylococcus aureus, which is commonly found on human skin and in the respiratory tract, according to the study. Some strains of Staphylococcus aureus can lead to food poisoning symptoms such as vomiting and diarrhoea, although most of the time these bacteria cause no harm except for minor skin infections, says the Mayo Clinic. The study also showed that the type and amount of bacteria differed based on the family’s size and socioeconomic status and their type of diet. Staphylococcus aureus was more likely to be found on towels from larger families with a lower socioeconomic status, while the intestinal bacteria was more likely to be found in families that ate meat. But what other germs are there hiding in your home? Here’s a look. According to NPR, a study suggested that many kitchen sponges could be inhabited by around 360 different species of bacteria and others have reported that there isn’t much you can do to get rid of them. Which isn’t exactly true. NPR suggests various things such as keeping them away from raw meat, cleaning the sponge every few days and not keeping them around for too long. According to Food and Wine, your toilet seat is disinfected all the time, but your sink isn’t given as much thought. 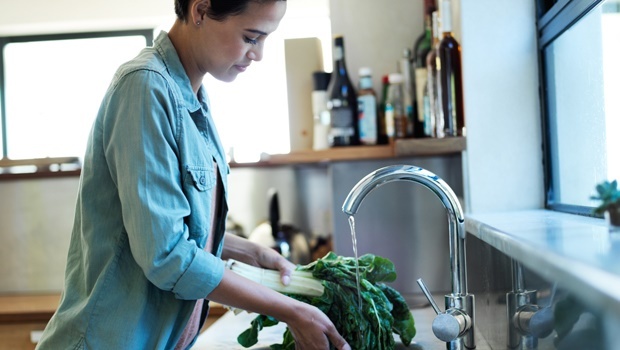 The sink is a great place for E. coli to live as it’s wet and moist. Bacteria also feed on the food you let go down the drain and what’s left in the sink. Dr Charles Gerba advises uses a disinfectant product made specifically for the kitchen to clean your sink. Your toothbrush is home to more than a 100 million types of bacteria including E. coli and staphylococci (Staph) bacteria according to the University of Manchester reports On Health. While the University of Alabama found that faecal germs were on your toothbrush too. Luckily your mouth is already full of bacteria so you probably won’t get sick from your toothbrush, but there’s still a risk. You should store your toothbrush far away from wherever your toilet is, or keep it in the medicine cabinet or a drawer instead. But also make sure your toothbrush dries properly between brushings as keeping it wet is a breeding ground for bacteria. Global News reports that Canadian microbiologist Jason Tetro says all the dirt in your washing machine can build up and land up back on your clothes, which ultimately affects the quality of your clothes and the lifespan of your washing machine. In the past when we used to hand wash, we used to use hot water to clean our clothes, plus at times bleach which would usually kill all the germs. But since our clothes now usually require a cold wash, those pathogens don’t really get killed off. Then add a warm or humid environment, and those germs have the opportunity to grow as well. But if you do want to kill off all those germs in your washing machine, run a hot water cycle with bleach about once a month to properly clean out all those nasty germs so they don’t get on your clothes.